Choose tomatoes grown outdoors (instead of in a hothouse) if at all possible. Organic or heirloom tomatoes could be a good choice, but they are not essential. As for the mozzarella, so many varieties are available these days that it is hard to choose. But if buffala — from a female buffalo — is available, that would be my top choice. Slice the tomatoes as you like and place in a shallow serving bowl. 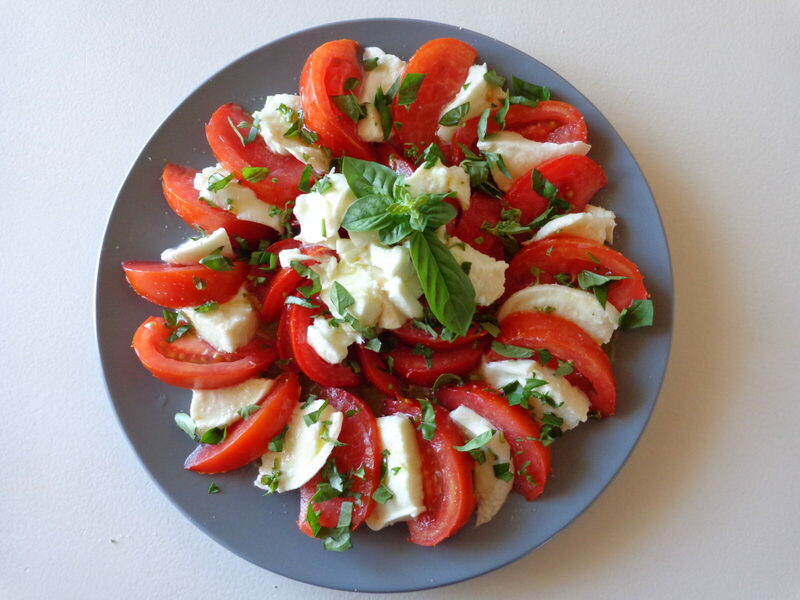 Slice the mozzarella in half crosswise, and then into slices or cubes. Arrange on top of the tomatoes. Season with salt and pepper. Add the olives if you are using them. Drizzle with the balsamic vinegar and then with the olive oil. Using a sharp scissors, snip the basil on top. Et voilà — it’s ready!